While playing World of Warcraft, you will acquire a good many items. Some will be looted from fallen enemies. Some will be purchased from a merchant. Others still will be the reward of completing a quest. In fact, for many players of WoW, their sense of purpose is found in acquiring new items. After learning the basic interface of the game, one of the first thing new players must do is come to grips with how World of Warcraft handles items. In the bottom-right corner of the screen is an icon for your backpack. Clicking on the backpack will open it. Notice that the backpack has 16 squares underneath it, known as inventory slots. Each item that you acquire, regardless of the real size of the object, will occupy one slot in your backpack. This means that as a starting player, you can carry a maximum of 16 different things. An open bag and quiver. However, there are some items that, because of their size or the number you would need of them, are able to stack. If you have more than one of these, they may occupy the same slot with a small number in the corner to indicate quantity. Only certain items can stack, and only to certain amounts. For example, you can stack food and water in piles of 20, you can stack ammunition in piles of 200, and you cannot stack several swords at all. There are also four empty spaces next to your backpack where you can add additional bags. At early levels, the bags you will be able to afford will only add another 6 or 8 slots of space, but four 6-slot bags are a tremendous improvement on the amount of raw junk you are able to carry. When you have money to spend for them, the bags can become larger than your backpack. There is no way at present to increase the size of your backpack. However, any time you acquire a new item, the game places it in the first open slot it can find. Considering you will be carrying around many different kinds of items, it pays to organize them. There are two ways to move an item to a different inventory slot. The first is to click on the item, and then click on the destination; the other is simply to drag the item to that destination. It is generally a good idea to use specific bags for specific things, such as a bag for tradeskill items, a bag for quest items, a bag for supplies such as your Hearthstone and bandages. There are a few bags that are for specific purposes. These containers are normally larger than other bags, but only hold one kind of item. For example, an herb pouch is a very cheap 12-slot bag, however it can only hold herbs. Not even alchemy potions or empty vials can be placed in this bag. Fortunately, newly-picked herbs will automatically go to this bag first until it is full. The best-known example of a special bag are quivers and ammo pouches. If you are playing a hunter, you probably even started with one of these. The quiver is really no larger than another bag, however it provides a bonus to ranged attack speed. As a result, since a hunter will typically be carrying large amounts of ammunition anyway, they can benefit greatly from this specialized bag. Each of the major cities has a bank somewhere in it. Banks allow a player to store items that they want to keep, but do not wish to carry around with them. Tradeskill supplies and armor that has a higher required level are two simple reasons why a player may want to use their bank. The bank begins with 32 basic inventory slots in it, but can be expanded to hold much more by purchasing bag slots. The bank bag slots work just like the bag slots in your character's inventory. Items can be obtained in quite a few different ways. The most common of these is looting dead bodies, but there are a few others. The player community will often find items for one another. A person who mines may collect ore for a blacksmith, or a random drop one person finds and has no use for may be of benefit to another. Here are a few ways you might remove items from your inventory, either into the hands of others or simply to make some money. Mailing them to another character, perhaps even your own! Because mailboxes are easier to find than banks or Auction Houses, many players create a low-level character that sits near a mailbox in a major city and receives items in the mail to place on the auction house or store in the bank. These sorts of characters are typically known as mules. If you need to dispose of an item, and none of these options are available, you can always destroy a less meaningful item to create space. Weapons and Armor are the two main types of equipment. Weapons and armor generally have more specific categories they fall under, such as Polearm or Plate, and not every class can equip all items. It is also possible you may need to train in a skill to be able to use one of these items, or that you must be a certain required level. See the article on Equipment for more details. To equip an item, you will either need to drag it onto the appropriate slot in your Character Window, or right-clicking it will automatically equip it. Be very careful when noting warnings about a piece of equipment becoming Soulbound when you pick it up or equip it for the first time. Many items have an effect that can be activated directly from the inventory, such a healing potion. 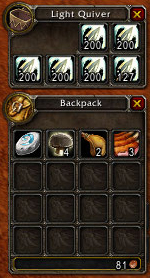 These items will generally have a "Use:..." description in their mouseover tooltip. Most usable items are consumables -- that is, they become used up and disappear. After you drink a healing potion, you certainly cannot drink it again! However, there are some items that are reusable. The most obvious of these is your Hearthstone. To limit these items from being used over and over, they usually have a cooldown. In the case of the Hearthstone, it cannot be used a second time until another 60 minutes have gone by. It should be noted that many pieces of equipment, such as Bladefist's Breadth also have a "Use:..." line in their description, which indicates that there is a special effect that can be triggered from these. This can only be done if the item is already equipped. These items will always have a cooldown, and that cooldown may need to recycle when the item is first equipped. An item that has no obvious purpose -- no stats, no use effect, no quest item status -- that is not in gray lettering is used for something. While it may not be obvious exactly what, 95% of the time, these items are used for tradeskill combines. Even if the item is not something you can use yourself with your particular professions, you may want to try to sell it on the Auction House rather than simply sell to a vendor. Items are also indicated by their quality level. If you look at two items that have the same required level, but their names are in different colors, one will probably be clearly more powerful than the other. This does not necessarily mean it is a better item for you, only that it has more raw potential. Gray (Poor) - These items are typically not worth doing anything other than selling. White (Common) - As equipment, white items will never have any attribute bonuses, but they are solid starting equipment. Tradeskill items are usually white. Green (Uncommon) - Green equipment will have some attribute bonuses, meaning they can be thought of as the first level of magical equipment. This means that they can be disenchanted, unlike gray or white. Green tradeskill items are more infrequently seen or otherwise special in some way. Blue (Rare) - Blue items generally represent very high quality gear. Blue items are most frequently seen as loot from instance bosses. Purple (Epic) - For a player who does not get involved with raiding, purple items are almost unheard of. Purple items are the highest level of equipment a player might realistically obtain. Orange (Legendary) - These are incredibly powerful items that require very special circumstances to acquire. There are only a handful of players who have one of the few legendary weapons in existence, and there are no other legendary items. Gold (Artifact) - An artifact represents such a powerfully-renowned item that there will only be one in existence on a given server. There are no artifacts in the game at this time. This page last modified 2008-06-17 09:17:13.